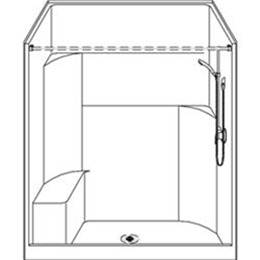 One piece 60" x 34" residential shower with a 5" threshold designed for shower door or curtain. Full 1/2" plywood backing on all walls for outstanding strength and customized installation of accessories/options. Luxurious polyester Gelcoat finish in solid colors. Accessories available: grab bars, no caulk drain, shower valve, matching soap dish, glide bar/hand shower, curtain and rod. Available with either left or right hand seat. Dimensions: 60" x 35" x 79"